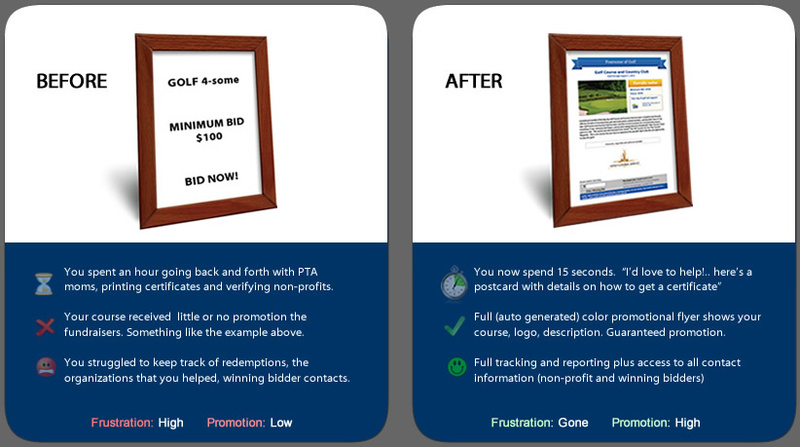 Your golf course is automatically promoted at fundraising events such as auctions for local schools and charities. We provide them with color flyers featuring your golf course photo, logo, and golf course details. You'll enjoy automated promotion to affluent supporters of non-profits (who are potential future customers / members of your golf course). "Your programs save our golf course managers a lot of time and make it easy to handle all of the requests that we receive. Plus our tournament sales managers love the extra promotion that you provide. Let's get all of our golf courses on your platform asap!" "OneSpareTeeTime is great and I love the time and resources that it saves me." Fully automated. 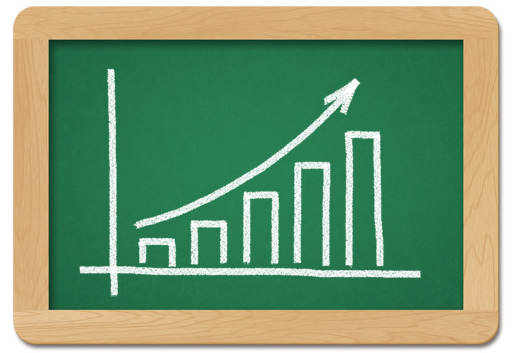 You decide how many certificates per year that you would like to issue. 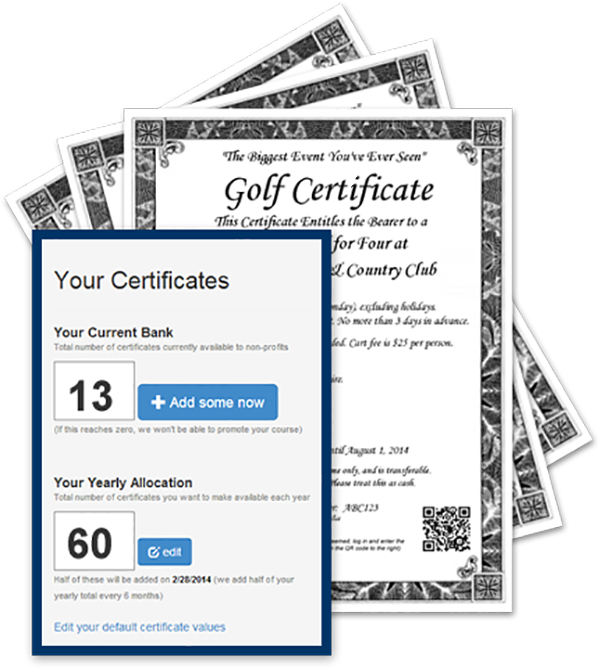 You decide on certificate details (twosome/foursome, range balls, validity, etc), and we handle the rest. When a charity asks you for golf, you now have an easy answer for them. No more spending time preparing expensive promotional packages or printing certificates. Set up your certificates so that they automatically fill slow periods (that would ordinarily go unfilled). Plus, you can collect a cart fee from each golfer. Lastly, golfers redeeming certificates are likely to be new players and likely to purchase food & beverage and/or merchandise. Your golf course's outing information is automatically promoted to non-profits within our network. 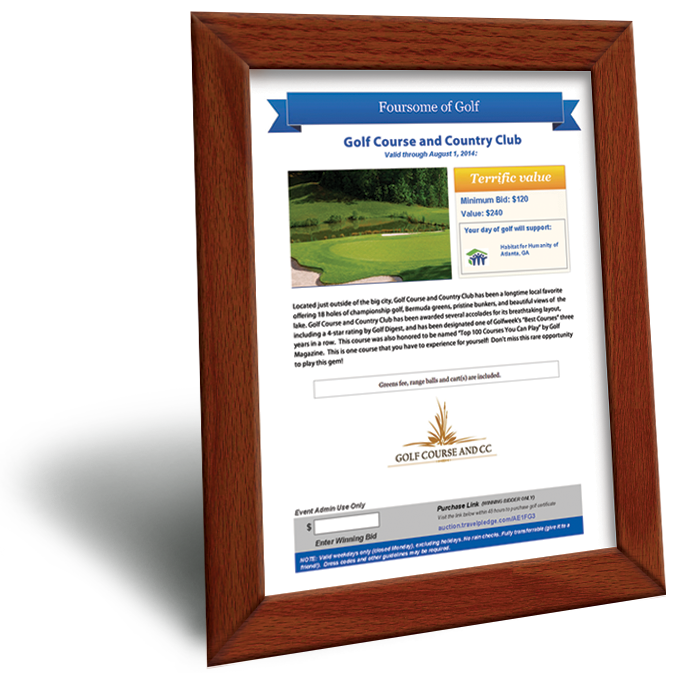 Golfers redeeming certificates automatically receive your membership offers. Added bonus!- participating golf courses enjoy a free listing on BestOutings.com.